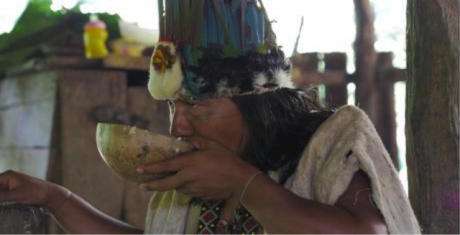 Manari Ushigua, political and spiritual leader of the Sapara community in Pastaza province. Photo: Punzano/Tucker Archive. All rights reserved.After experiencing first-hand the pressures put upon the indigenous people in the Ecuadorian Amazon during 2015, as two documentary filmmakers, we set about making ‘The Last Guardians'. Three years later after pre-production, two rounds of fundraising, filming with the incredible communities of Sarayaku and Sapara, and taking the film through post-production, ‘The Last Guardians’ has just been released on VOD, and is now available to audiences worldwide! In making the film, our aim was to raise international awareness around the key challenges facing the Sapara and Kichwa communities of Ecuador – and specifically, their long-running resistance to the imminent entry of oil companies into their territories and their efforts to preserve their culture in an increasingly globalised world. More broadly, we seek to draw attention to their rich indigenous worldview and culture – one which we believe can greatly inform the international community. Both practically and philosophically, their outlook offers a unique perspective on the current battle with climate change and the prevention of further environmental degradation in key biomes such as the Amazon. During our time filming ‘The Last Guardians’ we worked closely alongside the Sapara community of Llanchama Cocha and Kichwa of Sarayaku, two communities bound together by a shared past, their common language – Kichwa – and now through their resistance to the Chinese-owned oil consortium Andres Petroleum following the illegal auctioning of oil blocks 79 & 83 in January 2016. Being amongst the Sapara and Kichwa in the dense jungle of the Pastaza province, we were able to spend time working with a range of community members – including the spiritual and political leader of the Sapara nation, Manari Ushigua, his sister Gloria, President of the Sapara Women’s Association, Patricia Gualinga the International Relations Director of Sarayaku and a range of others. They had a great impact on us, as we discussed at length their unwavering resistance against the entry of oil companies, the indigenous world view and the vital role of women at the forefront of their struggle. We also spent time filming in the deforested oil town of Nueva Loja to the north of the Sapara and Kichwa territories, where Texaco (later Chevron) began drilling operations at Lago Agrio in the 1970s. The experience here was a stark and sobering contrast to the preserved rainforest, as we conducted interviews with affected communities in the region who have had to experience the effects of contamination from petroleum extraction first-hand. Meeting with reprasentatives from the ´Frente de La Defensa De La Amazona´- an organisation representing locals in their battle with Chevron - we explore in the film the full impact of oil extraction and its associated extraction. It is clear that in the cases of Nueva and Coca, the negative consequences continue to blight the lives of locals, even decades after Texaco/Chevron’s drilling took place, including a crippling prevalence of cancer from consumption of polluted water and other health issues. Through the combination of extensive interview footage, interweaved with scenes from everyday life in the forest – such as hunting, fishing, agricultural work and ceremonies – ‘The Last Guardians’ presents a detailed insight into life in these communities but also acts as a vehicle to help carry their voices to a broader, global audience. We hope the film will play a part in inspiring the international community to take real notice of the messages of indigenous communities and join the growing movement to both support them and work towards enacting some of the key changes required to preserve their territories to help conserve the planet for all.